UNITED NATIONS, January 3, updated -- As South Africa on Tuesday fully took over the presidency of the UN Security Council and met with other Council members, requests were made for a Council briefing on Syria. By Tuesday afternoon, Inner City Press learned from a country not pushing for it that a briefing on the topic will "most probably" take place on December 10, by the UN Department of Political Affairs, led by Lynn Pascoe of the US. This country argued, as have others, that the Council should wait for the outcome of the much-questioned Arab League mission to the country. 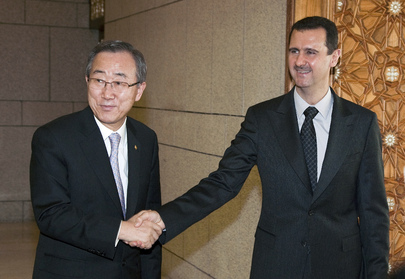 In response to questions from Inner City Press over the holiday, the Office of the Spokesperson for Secretary General Ban Ki-moon declined to comment on the killing of citizen journalist Basil al-Sayed in Homs, and on the fact that the Arab League team is headed by a Sudanese military figure active in the war crimes zone of Darfur. which is the first of its kind undertaken by the League of Arab States. It is critical that the observer mission be given unhindered access and full cooperation by the Government of Syria, and that its independence and impartiality be fully preserved. We look forward to hearing more from the mission. We hope that the League of Arab States, under the able stewardship of its Secretary-General and its membership, will take all steps possible to ensure that its observer mission will be able to fulfil its mandate in accordance with international human rights law standards. On Syrian journalist: We are checking for more specifics on this. If we have more we'll let you know. Since then, Ban's office has said nothing about the dead journalist, nor the appropriateness of the Arab League team's leadership. Likewise, when Inner City Press asked in writing then in-person on January 3 about Egyptian authorities' raiding NGO offices, Ban's spokesman Martin Nesirky, saying he was "carefully" choosing his words, emphasized that Egypt is in transition. Why so careful? Some say it is a response to Russia's complaints about Ban taking sides by claiming that Security Council resolution 1973 in Libya was fully complied with, despite even the New York Times counting as least 50 civilians killed by NATO bombing. So now Ban sways the other way. But what will Pascoe say? While even a country not favoring the Syria briefing says it will happen "most probably" on January 10, the issue will still have to come up in Council consultations to be formalized. Thus, when Inner City Press asked French Permanent Representative Gerard Araud when he emerged, "Syria briefing on the tenth?" he said, "Not yet." But even a country not favoring the briefing says it is "most probably" January 10. Watch this site. Update of 6 pm -- Inner City Press is informed that the Syria briefing, by Lynn Pascoe, will be on the morning of January 10, under the heading "DPA Briefing." On the Council's Libya meeting this month, there are moves afoot to get High Commissioner for Human Rights Navi Pillay, and "maybe Gebril" / Jibril. Watch this site.